His Highness Sheikh Dr Sultan bin Mohammad Al Qasimi, Member of the Supreme Council and Ruler of Sharjah, revealed a new archaeological discovery of major historical significance to the region in Mleiha Archaeological Centre. His Highness the Ruler of Sharjah unveiled the discovery of inscriptions engraved on a tomb that date back to the third century BC, in the presence of His Highness Sheikh Sultan bin Mohammed bin Sultan Al Qasimi, Crown Prince and Deputy Ruler of Sharjah and Sheikha Bodour bint Sultan Al Qasimi, Chairperson of Sharjah Investment and Development Authority (Shurooq). The historical treasure was discovered by a Belgium expedition from the Royal Museums of Art and History in Brussels, in collaboration with the team of the Directorate of Antiquities at the Sharjah Department of Culture and Information. The recovered treasure features inscriptions engraved on a huge grave consisting of an undergound burial chamber measuring 5.20 square meters. The inscription, written in Aramaic and southern Arabic language, carries the name of Amad bin Jar bin Ali Kahin, the king of ancient Kingdom of Oman, and his identity and descendent. The inscriptions also include the date when the Tomb was built. It says the tomb dates back to 90 or 96 according to the Greyhound history, equivalent to the year 222/222, or 216/215 BC, making it the oldest historical discovery that refers to Oman and also proves that the ancient Kingdome of Oman existed in the late third century BC. The announcement was made by His Highness the Ruler of Sharjah when he inaugurated the first phase of the Meliha Archaeological and Eco-tourism Project, which is one of the most important tourist and archaeological projects in the UAE, and the largest of its kind in the Central Region of the Emirate of Sharjah. His Highness the Ruler of Sharjah, launched the Mleiha Archaeological Centre, the first phase of the project, which displays ancient relics found at Mleiha. The centre takes visitors on a tour through Mleiha’s history over three millenniums in its separate sections. The centre will be constantly updated as new findings are uncovered through ongoing excavation work and placed on display there. There are informational displays with historical facts, and screens with documentaries about Mleiha’s story. His Highness was introduced to the various services provided by the center which includes administration offices, a prayer room, a shop selling “I love Sharjah” products, guided tours, as well as cafes and lounges. 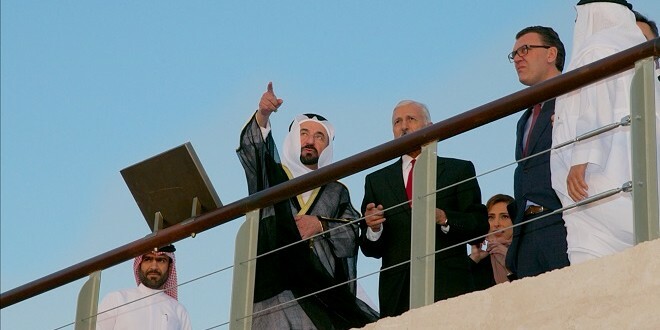 During the inauguration of Mleiha Archaeological and Eco-tourism Project His Highness visited a number of prominent archaeological sites such as the Umm An-Nar Tomb, the Valley of the Caves, the Mleiha Fort, and the pre-Islamic Mleiha Palace, historic horse and camel graveyard, and the ancient farmhouse with kitchen. These significant sites dates back to early man and give an insight in to how our ancestors lived. The Mleiha Archaeological and Eco-tourism Project is in-line with Shurooq’s strategy to enhance the positive impact of development projects on society, the economy and the environment of Sharjah. This is done by attracting investments in both the Central and the Eastern Regions, by providing job opportunities for residents, and highlighting the tourist and historical components of the Emirate of Sharjah and of the United Arab Emirates, through presenting the area’s rich archaeological and cultural heritage. It is in an area with an abundance of natural terrain, such as mountains and desert, and there is also considerable diversity of rare plants in the region. The project is expected to attract thousands of visitors, particularly nature and heritage lovers, to introduce them to the region’s rich archaeological heritage. It will also affirm the emirate’s advanced position in the field of eco-tourism and archaeological tourism, and will contribute to achieving Sharjah’s vision of tourism in 2021. 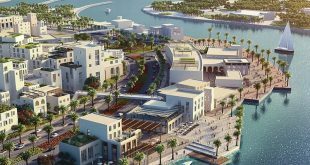 The project provides added value to investors, representing a holiday destination in a stunning setting that comes with tourist, sporting and entertainment facilities. 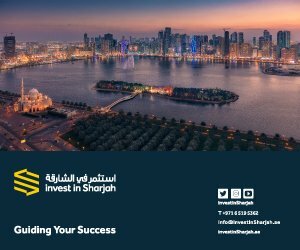 Investment in the project is expected to reach approximately 250 million AED. The second phase of the project is scheduled to begin soon and will include the establishment of the 450 square kilometres, Mleiha National Desert Park in collaboration with the Sharjah Environment and Protected Areas Authority (EPAA). The park will serve as a wildlife reserve with a range of indigenous animals such as the Oryx, gazelles and the mountain deer. 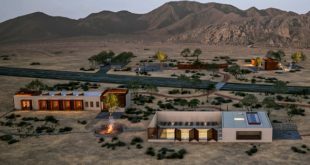 There will be allocated areas for bed and breakfast style hotels and a Night Camping Park, which will be fully equipped to cater to the needs of camping lovers. The wealth of opportunity in the area will be presented to investors who can take advantage of the tourist market on offer. Phase Two will also see the establishment of an astronomy observatory in cooperation with the Sharjah Centre for Astronomy and Space Sciences, allowing for enthusiasts to enjoy the stars and sky from the center of Mleiha. Telescopes will be installed on the roof of the Mleiha Archaeological Centre to allow visitors a glimpse of the stars and the wonders of space. There will be various sporting activities such as the Adrenaline Adventures with dune buggies and quad biking activities. Visitors will have the opportunity to undertake environmental friendly off-road activities in 4X4 cars and there will also be guided walks on camel trails to see the paths ancient civilizations took to cross the desert. Mleiha Archaeological and Eco-tourism Project has been nominated by UNESCO as a World Heritage site, reflecting the rich archaeological and cultural heritage of the area, and attracting more visitors and investors. Such a listing will help the project continue to protect indigenous wildlife and assists in maintaining the distinctive archaeological sites, some of which date back to the third millennium BC. The Mleiha Archaeological and Eco-tourism Project is a collaboration between Shurooq, the Planning and Survey Department, the Environment and Protected Areas Authority in Sharjah, and the Directorate of Antiquities at the Sharjah Department of Culture and Information. It is unique tourist destination due to its natural beauty, diversity of rare wildlife and its archaeological discoveries which has seen it nominated by UNESCO as a World Heritage Site. The project will also help preserve the outstanding archaeological sites that date back to the third millenniums BC, and also protect rare wild animals, such as the Arabian Tahr, the Arabian Oryx, sand gazelle (Al Reem), and Damani gazelles and ostriches. It also gives tourists an opportunity to enjoy an exciting adventure from one of the three luxury hotels that will be set up there, and to explore archaeological treasures and rich ecological and biodiversity in Mleiha and its surrounding areas.